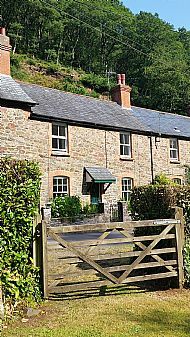 Robin's Brook self catering cottage is a hundred-year old former quarry-man's cottage in a quiet location, on a no-through road at the edge of the thriving village of Porlock, in the beautiful Exmoor National Park. It has a large enclosed garden with Hawkcombe stream running alongside. Turn left out of the front door for an easy walk to the varied shops, pubs, restaurants, tea rooms and galleries of Porlock. Turn right to walk up through Hawkcombe woods and on to stunning moorland scenery, looking out for red deer and Exmoor ponies as you go. It's excellent dog walking country with many dog friendly pubs and tea rooms. Drive up Porlock Hill and beyond for glorious walking and views of Exmoor, with Dunkery Beacon and the sea. Around 30% of our guests have previously stayed at Robins Brook. 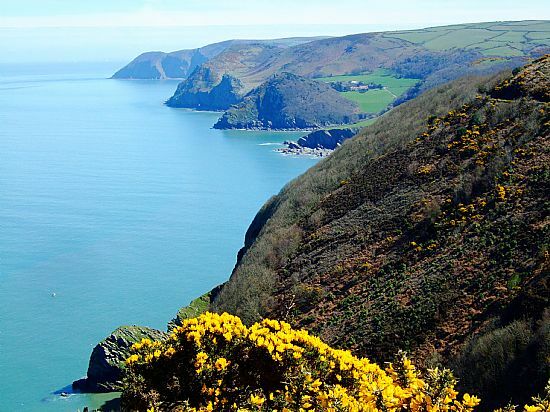 Explore Lorna Doone country, Countisbury, Watersmeet, Lynton, Lynmouth and much more - a relaxing paradise for walkers, horse-riders, bird-watchers, and naturalists alike. The Exmoor coastline is amongst the best in the UK and the walks and views are superb. The combes boast ancient woodland busrting with life and most have bubbling streams that footpaths follow. From the combes you emerge onto wonderful heather-clad moors. Enjoy stargazing in some of the best starlit skies in the world - Exmoor National Park has been designated an International Dark Sky Reserve, the first place in Europe to achieve this award!